What will happen in Bratislava from 15th February onwards? From February 15, Mlynské Nivy Street and some driveways from Prístavný Bridge to Slovnaft and Prístavná Street will be completely closed for six months. This will have a significant negative impact on traffic in the eastern part of Bratislava. A further increase in vehicles will mean a lot of traffic jams. In order to cope with this, we set up separate lanes for public transport on critical sections of roads. By using public transport you can avoid being stuck in a traffic jam. The more drivers take advantage of the public transportation, the less time those who really need to use the car spend in traffic jams. We can do it together! 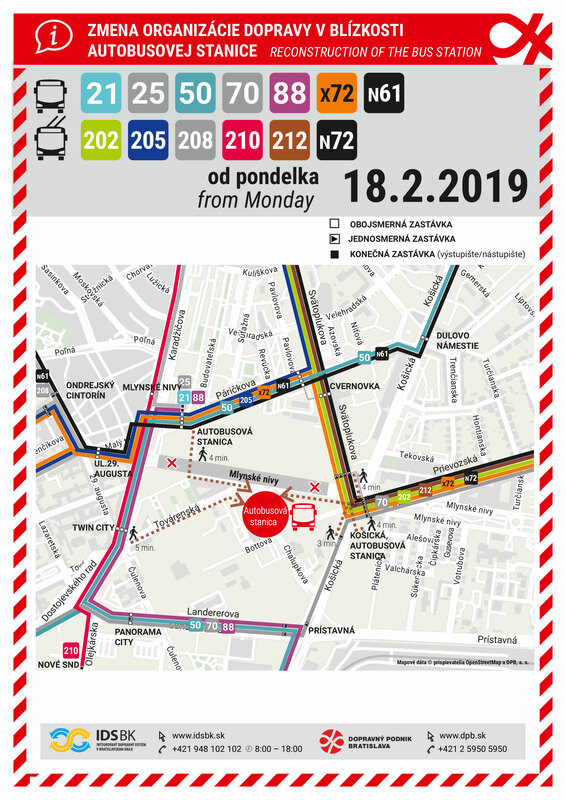 The most important change in the public transport at times of traffic restrictions will be the bus lanes on Gagarinova Street in direction in and out of the city and the bypass route of Mlynská Niva Street – Páričková Street in both directions. Thanks to this, the public transport will become the fastest way of transportation in all critical sections during that time. All details will be regularly put on the website of the Bratislava Transport Company. From Monday, 18 February until the end of March, all rides on lines 201, 202, 212, 75 and X72 will be free. In addition, the BID offers at this time also a 50% discount on the weekly bus ticket (you can purchase the ticket through IDS BK App for iOS or Android – payment via card only). In the direction from Vrakuňa and Podunajské Biskupice to the western and central part of the city and the city part of Ružinov, use trolleybus lines no. 201, 202 and bus no. 75. When heading to the north and west of the city, use the line no. 201 on the route Vrakuňa – Ružinov – Trnavské mýto – Račianske mýto – Hlavná stanica. When heading to the city center and in the direction of Mlynské Nivy, take bus no. X72 on Miletičova stop. Bus no. X72 goes through Páričkova Street in both directions. In the direction of Kollárovo and Hodžovo Square, use bus no. 202 on the route Vrakuňa – Ružinov – Nivy – Svätoplukova – Záhradnícka – Kollárovo Square – Hodžovo Square (via the BUS lane on Gagarin Street). To get to the city center, change at the stop Miletičova, Novohradská or Košická (Bus station) to bus no. X72. In the direction from Vrakuňa to Ružinov via Nové Mesto to Krasňany use bus no. 75. We advise residents of Prievoz to use bus no. 212 on the route Cintorín Vrakuňa – Prievoz – Ružinov – Nivy – Svätoplukova – Záhradnícka – Kollárovo Square – Hodžovo Square – Kramáre – Patronka (via Mierova Street). To get to the city center change at the stop Miletičova, Novohradská or Košická (Bus station) to bus no. X72. Páričková Street will only be available to public transport vehicles and taxis. Páričková Street bus lines: no. X72, 50, 205. The routes of bus no. 88 and no. 21 ending at the former bus station will remain unchanged. On Páričková Street there will be two public transport stops at the VÚB Bank (Bus Station) building and at the Svätoplukova Street (Cvernovka) intersection. Passengers can also use the lines of Slovak Lines that serve Gagarinova Street as a part of the Integrated Transport System of the Bratislava Region (IDS BK). All you need is a valid bus ticket or a pre-paid card. Tickets to regional buses of SAD Dunajská Streda (outside IDS BK) must be purchased at the driver. Regional lines stop at the most important stops in Vrakuňa and Gagarinova Street, including Cintorín Vrakuňa. Click to open large in a new window.